Hooe you feel better. Hang in there, momma- you’re almost tgere!! Absolutely love those wedges. Such a cute pattern and it’s neutral colour will go with everything. This coming A/W is all about the ruffles! Super cute top Rach, those wedges have been on my wishlist for months, I need to make the commitment! Those Jeffrey Campbell wedges are my favorite!! 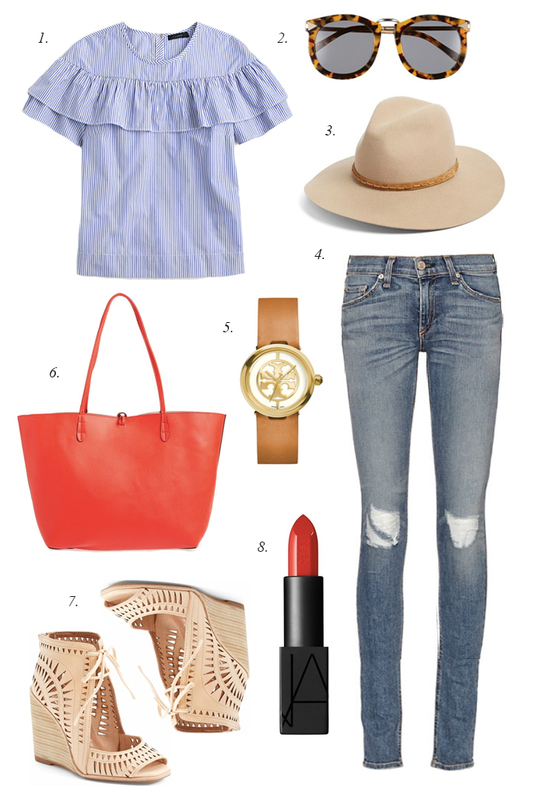 That J.Crew ruffled top has been calling my name…SO cute! I’m in love with that ruffle top! It’s so cute! This is such a great look! Yes the ruffle top is my favorite! I love chambray and red together! It’s very cute and reminds me of Dorothy from the wizard of oz! Love all of these picks, especially that ruffle top! fun picks! the ruffle top is darling! Just bought this shirt the other day! Cute Outfit! I’ve been eyeing those wedges for WEEKS now. I think it might be time to bite the bullet :) love the look! Gorgeous picks! I absolutely love those wedges! They are summer perfection! Thank you! Yes they are I love them!! thank u so much for giving us some inspiration!! !